These Breakfast Air Fried Potatoes are crispy on the outside and tender on the inside, just how breakfast potatoes should be. 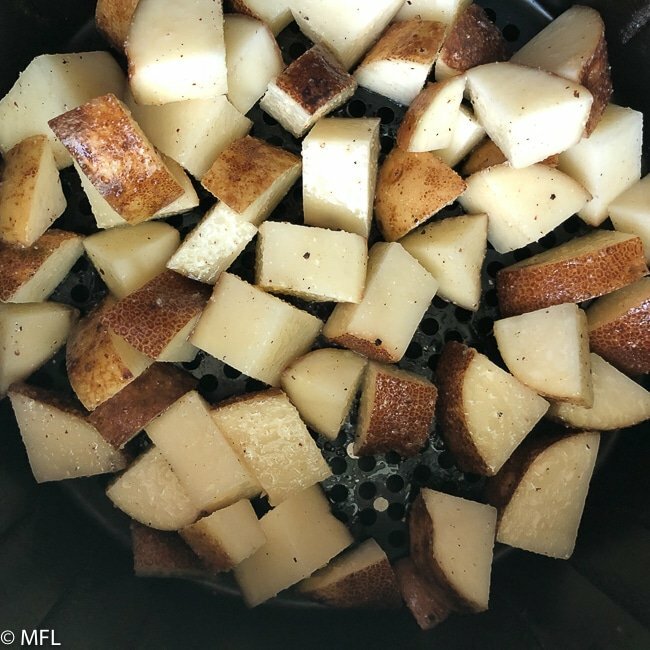 Step by step photos included to get the perfect breakfast potatoes in the air fryer. This post may contain affiliate links, please read my full disclosure here. I love to make a big breakfast for my little family on Saturday mornings. This breakfast can range from biscuits and gravy (yum), to buttermilk pancakes (double yum), to freezer waffles (I know, I know…not so yum). Our weekend morning breakfast wouldn’t be complete without some good old fashioned breakfast potatoes as a side. 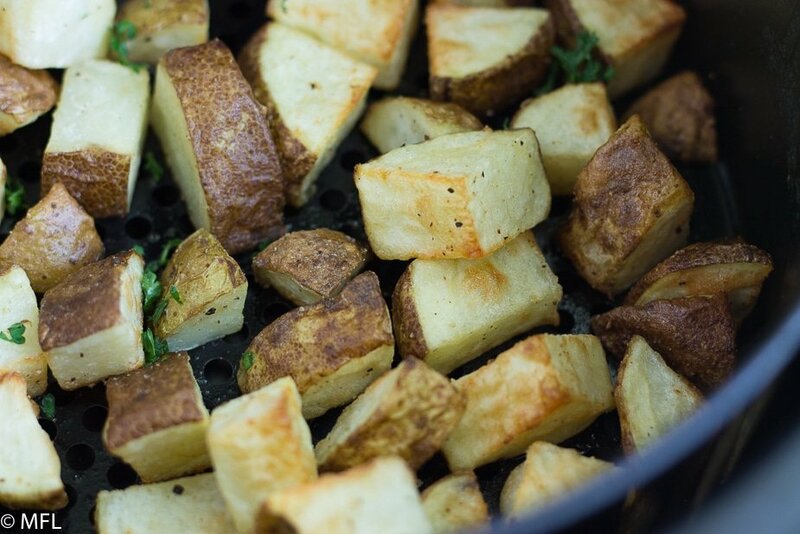 Air Frying potatoes is pretty simple and can be done in 5 easy steps. 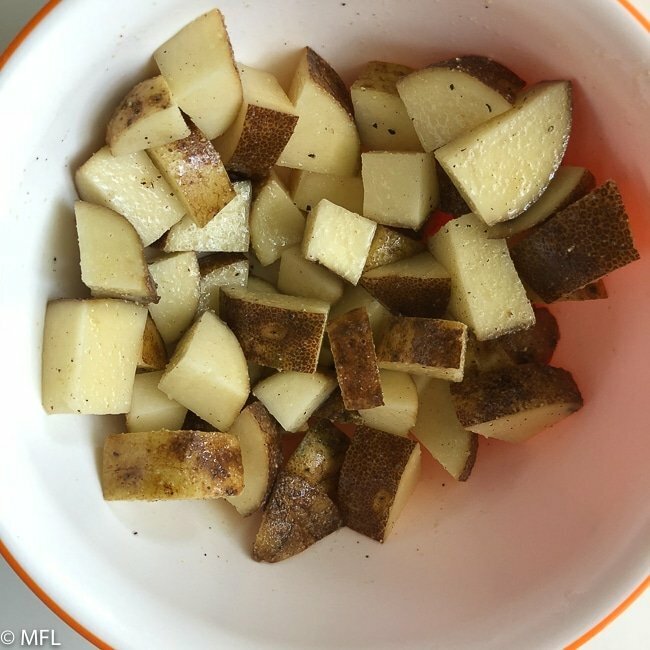 All 5 steps are critical in making the perfect breakfast potatoes in the air fryer, especially step number 2, soaking the potatoes. I’m sure many people will be dissapointed when they hear about doing this step but it’s necessary. Soaking potatoes in cold water removes the extra starch that potatoes have and results in a potato that is perfectly crisp on the outside and tender on the inside. It’s actually a method used by many chefs when it comes to frying a potato in hot oil. It makes sense that the same process would apply to the air fryer. Feel free to have fun with these breakfast potatoes. I like to keep my super simple and use dry seasonings. You can add onions and peppers if you like. You can also adjust the seasonings for taste preference. Just make sure to put a bottle of hot sauce on the table when serving because…hot sauce is amazing. These Breakfast Air Fried Potatoes are crispy on the outside yet tender on the inside. 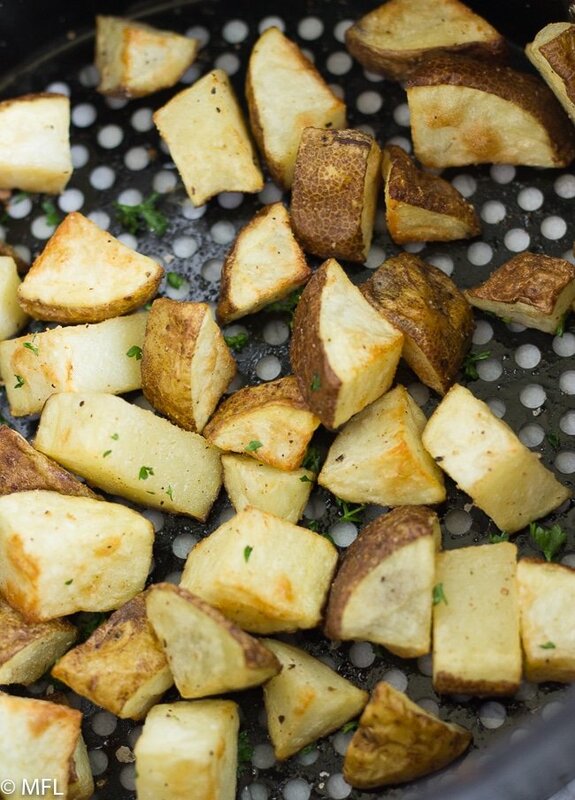 Cook potatoes to perfection with this method. 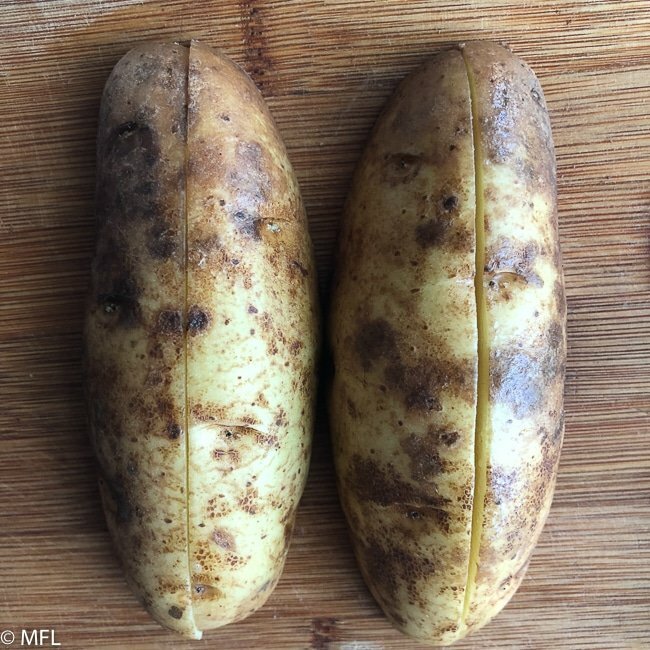 Clean and scrub potatoes under running water. Dice potatoes into 1/2 inch cubes. 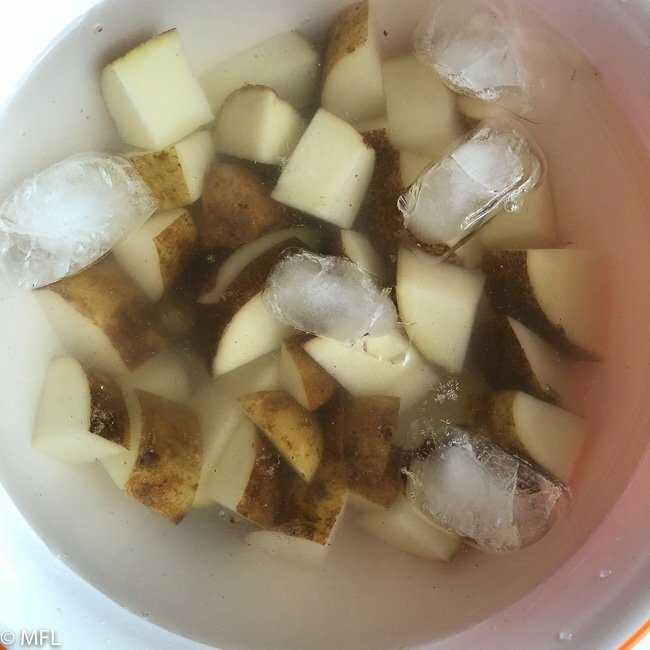 Place potatoes in bowl and cover with ice cold water. Allow to soak for 45 minutes. 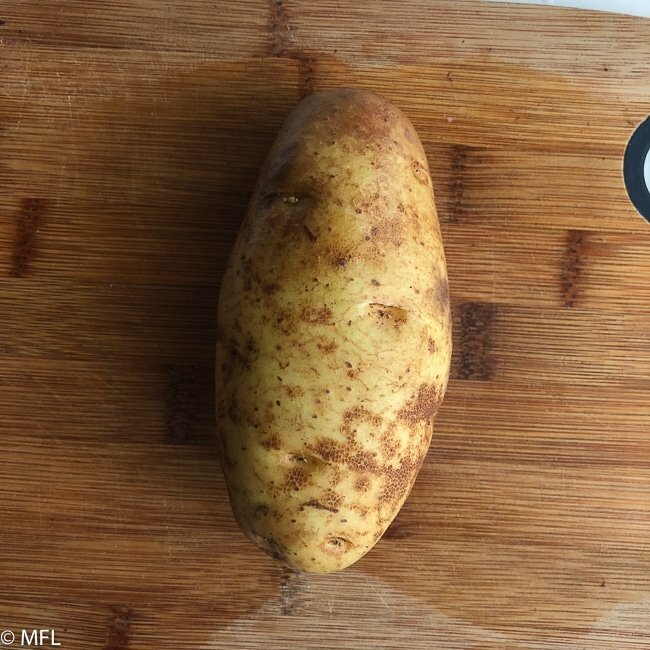 Remove potatoes from water and dry with paper towels. Add potatoes in dry bowl and add olive oil, salt, garlic powder. Stir potatoes ensuring that all pieces are covered in oil. Place in air fryer basket. Cook at 400 degrees Farenheit 20-23 minutes, shaking the basket halfway through. Potatoes are done when they are golden brown on the outside and soft on the inside. 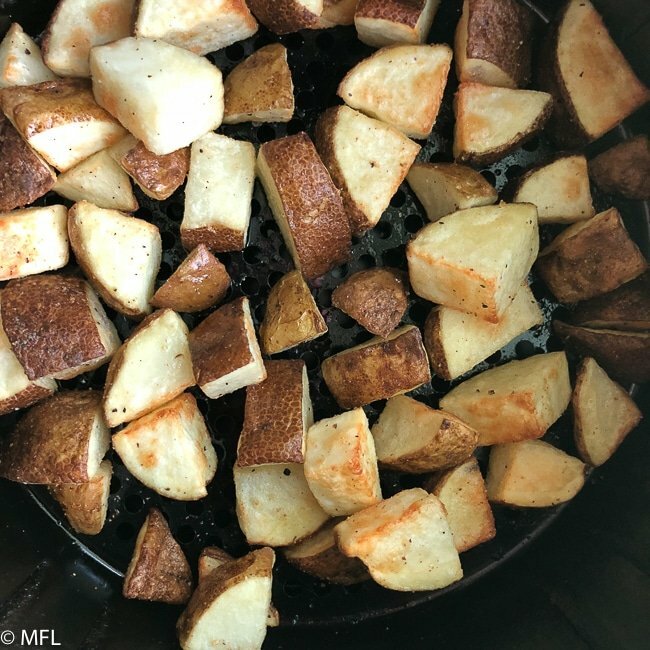 You can do more or less potatoes in the Air Fryer. Cook time will remain the same, just ensure to shake halfway through. Careful not to overcrowd the air fryer basket. A single layer of potatoes is ideal but some overlap is ok. Shake basket to ensure even cooking. Need more air fryer recipes? Try my Perfect Air Fryer Steak , my Crispy Air Fryer Fish. 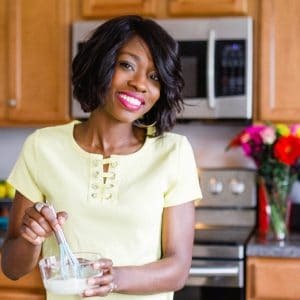 Looking for more air fryer breakfast recipes? try this Air Fryer Egg Frittata recipe. 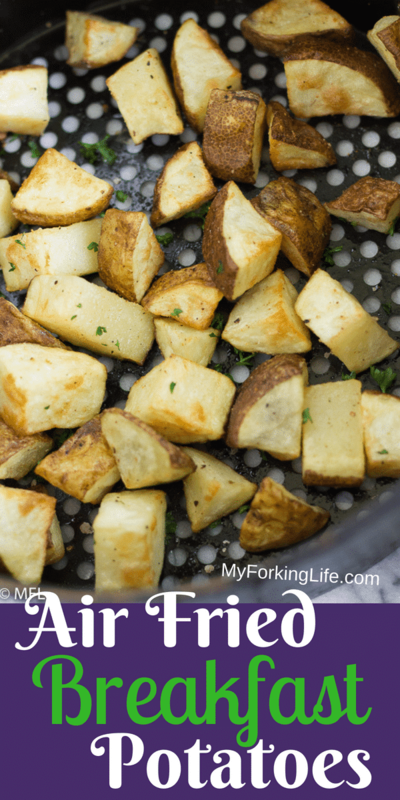 If you’re looking for another way to make potatoes on your Air Fryer, these Air Fryer Potato Wedges are sure to be a hit. 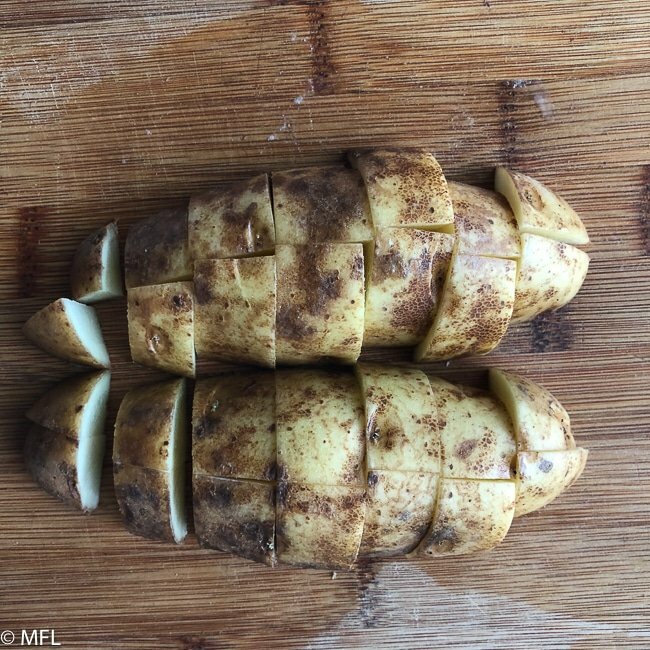 Cut potato in half. Then cut the halfs in half. Dice potatoes into 1/2 inch cubes. Place in ice cold water and let soak for about 45 minutes. I added ice to my water because I’m silly like that. Drain potatoes and dry with paper towels. Place in a dry bowl and add the rest of the ingredients and stir, ensuring the potatoes are evenly coated with the ingredients. Place in air fryer basket. Set to 400 degrees Farenheit and cook for about 20 minutes, until potatoes are golden brown on the outside and soft on the inside. Tried this for breakfast tacos. Added cilantro & onion powder (wasn’t sure if chopped onions would have worked, so didn’t experiment…maybe next time!) to the ingredients. Cooked for less than 20 mins because I was only cooking one potato. It was done in about 10 minutes. The potatoes came out crispy and cooked. Absolutely perfect for the eggs & potato tacos. Thanks. This recipe’s definitely a keeper! Awesome! So glad you like it. Air fryer potatoes are the best! 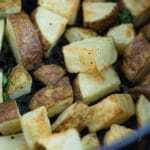 Can the potatoes be prepped the night before and allowed to soak overnight in the fridge to shorten the time needed to make this dish in the morning? Hi Dawn and Laura, I’ve never soaked overnight but it should work, as I’ve read elsewhere that some people soak overnight. If you are going to soak overnight, I’d make sure they are in the fridge so the water is cold. Wow this is my kind of side dish, looks yum! So quick and easy for breakfast! Thanks for this!